This most interesting surname, of medieval English origin, is a patronymic, of the medieval personal name "Dobbe", which is itself a pet form of Robert, from "Hrodebert", a Germanic personal name composed of the elements "hrod", renown and "berht", bright, famous. Robert, though found in England before the Norman Conquest, became more widespread among all classes of society afterwards. Dobb itself is a popular surname in the North of England and the Midlands. Other patronymic names from this source include Dobbin(g)s, Dob(b)inson, Dobbison and Dobbieson. Dobson itself is also found fairly widespread in County Leitrim, Ireland, probably as a result of the influx of early English settlers into the country. 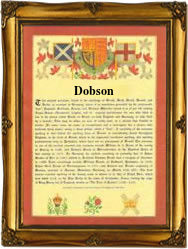 One Roger Dobbessone appeared in the "Enforcement of the Statutes of Labourers, 1349 - 1359", in Cheshire (circa 1356). William Dobson (1610 - 1646), was introduced to Charles 1 by Vandyck and was one of the earliest English subject and portrait painters of eminence. John Dobson (1787 - 1865) an architect, designed new streets and public buildings in Newcastle-on-Tyne. He is reputed to be a pioneer of the modern Gothic revival. The first recorded spelling of the family name is shown to be that of Henry Dobbesone, which was dated 1327, in the "Subsidy Rolls of Worcestershire", during the reign of King Edward 111, known as "The Father of the Navy", 1327 - 1377. Surnames became necessary when governments introduced personal taxation. In England this was known as Poll Tax. Throughout the centuries, surnames in every country have continued to "develop" often leading to astonishing variants of the original spelling.